Check Shift Dress is rated 4.5 out of 5 by 11. 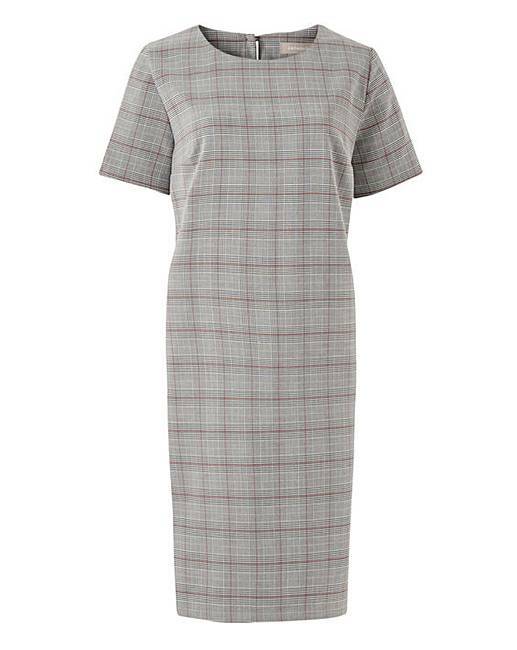 This check shift dress is a must-have for the new season. Adorned in an all-over check print, the shift shape features short sleeves and a round neck. Pair with court shoes for an ideal workwear look. 82% Polyester, 16% Viscose, 2% Elastane. Rated 4 out of 5 by Berniexx from Standard value for money shift dress Basic wardrobe staple. Value for money in the sale. I am about 5' 2-3" and it is a decent length on me, just! A good work standard, works with knee high boots, heels, flats. Rated 4 out of 5 by samcat from An attractive dress for all occasions Haven't had the opportunity to wear this yet but I think it's a really nice dress that can be worn for casual or smart occasions if accessorised with a scarf or jacket. The material is not too thick & it hangs well. Rated 5 out of 5 by mandy from Excellent Work Dress Bought for work, look smarts, comfortable to wear and washes well.